If you like the H6300 series of Samsung televisions (including the 55", 65", and 75" versions), then you may even want to look at the 60 inch Samsung UN60H6300 LED LCD HDTV. If the perfect tv size for you is 60 inches, then this is the right tv for you. Not only does the UN60H6300 provide a great viewing experience for television, movies, and streaming content, but there are also apps and a built in wifi that comes with the tv. Gone are the days of tvs with rabbit ear antennas and knobs on the tv to change the channel. This tv allows us to enjoy the latest in television technology. Samsung UN60H6300 60 inch HDTV to watch movies and your favorite tv shows. Samsung UN60H6300 60 inch offers many advanced features. 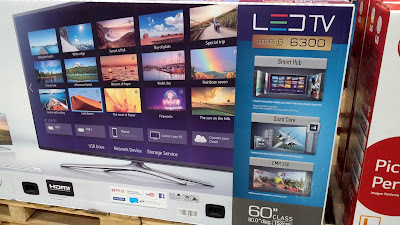 Samsung UN60H6300 60 inch tv deal at Costco with rebate. Bask in the brightness and detailed contrast of Samsung LED TVs. With Samsung LED TVs you can experience vivid color with a brighter picture and a beautifully thin profile. Explore shows, movies, apps, and social media on the intuitive and intelligent Samsung Smart TV. The Smart Hub interface organizes your entertainment and content into 5 panels. Effortlessly navigate through movies, live TV, streaming content, apps, social networks, and more. Receive personalized TV and movie recommendations based on your own preferences and what's popular and trending.